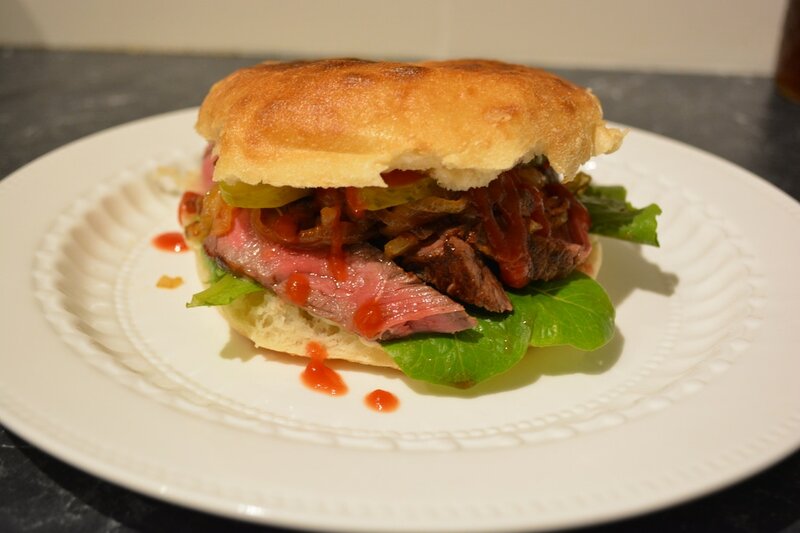 I have tried this steak sandwich a few times now, and I love the flavours, it is delicious. But I always had a problem with the meat, I found it tough. I have tried it with veal schnitzel, I also tried minute steak, I cooked them quickly, but still you bite into the sandwich and the meat was hard. Well, I have found the meat I love. Now I only make this with beef scotch fillet or a porterhouse steak. I cook it to a maximum of medium and I enjoy every single soft, succulent bite. The steaks should only be around 1.5cm in thickness. 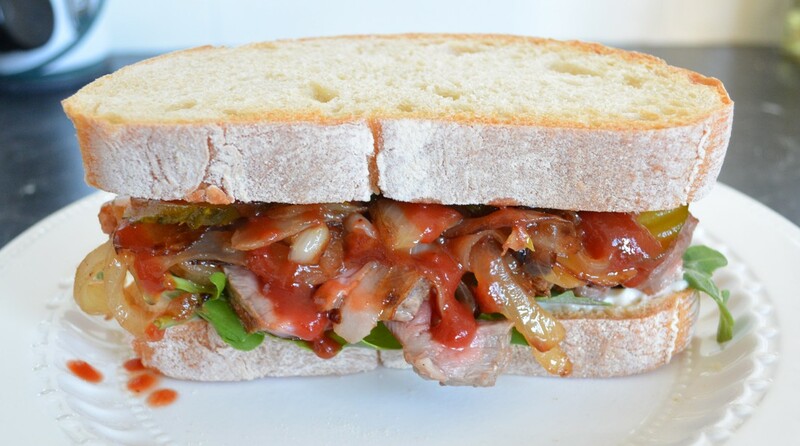 If you buy really thick steaks, fry or barbecue them to your liking, then slice them thinly onto your sandwich. For the bread, use your favourite bread. I added mayonnaise and tomato sauce to my sandwich which wasn't in the original recipe and you get one of the most delicious sandwiches you will ever try, and it is so quick to prepare. So if you need a quick meal idea, try this it is so good. Heat oil in a large frying pan over high heat; cook onion, stirring, until golden. Remove from heat, set aside in a bowl. Season steaks with salt and pepper. Add the steaks to the same pan, cook steaks until done to your liking. Assemble your sandwich: Place 4 pieces of the toasted bread on a serving platter or on individual plates. Spread the bread with mayonnaise. Place the rocket (or baby spinach or lettuce leaves) on top of the mayonnaise, top with the steak, onion and cornichons. Drizzle on some tomato sauce and top with remaining piece of toast.